A Paper Pumpkin Designed by Our CEO! Get April’s Paper Pumpkin Designed by Our CEO! Wow – now here’s a chance at an exclusive! Get a Paper Pumpkin designed by our very own Stampin’ Up! CEO Sara Douglass! 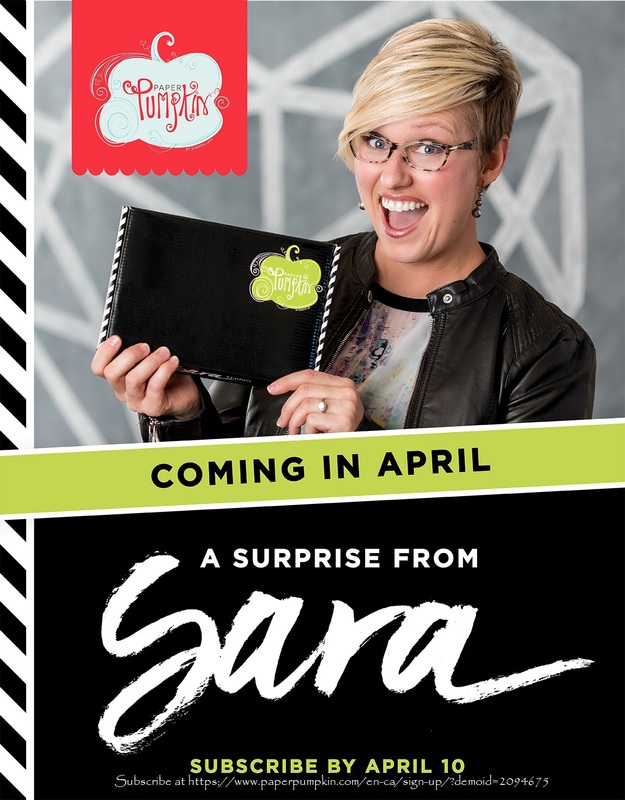 Sara has designed the April edition of Paper Pumpkin! Sara herself describes the kit as ‘bold, vibrant, artistic – and with a little bit of sass!’ (I think that’s kinda like Sara herself!) I can’t wait to see what she’s designed – how about you? As if a Paper Pumpkin kit designed by our CEO, Sara is not reason enough to sign up, there’s more! She’s including a FREE gift inside every April box! We’re keeping it a surprise, but you won’t want to miss it – I know I don’t! Sign up for a Pre-Paid Subscription before March 31st, and instantly qualify for a FREE SALE-A-BRATION item! Pay only $74 (a $4 savings) for your 3 month Paper Pumpkin subscription before March 31st, and you’ll receive the April, May and June Paper Pumpkin kits, PLUS a Free Sale-A-Bration item, PLUS the FREE gift in April’s Paper Pumpkin kit! For a Pre-Paid Subscription, you can either contact me to place your order, or ORDER ONLINE in my store, which is open 24/7. It’s a Win, no matter how you sign up! Next Next post: PCC235 Sketch Challenge with Hey Chick!